TACLOBAN CITY – Reacting to the rejection today by President Benigno Simeon Aquino III of a petition signed by more than 17,000 typhoon Yolanda (Haiyan) survivors from Eastern Visayas demanding emergency cash assistance and other government aid, the People Surge alliance said the P40,000 being sought for each family was legitimate and the President was in the wrong. Bautista said the neglected Yolanda survivors are only one of many among the rest of the Filipino people who are bringing forward their grievances – the pork barrel scam, the soaring prices of basic commodities, water & electricity, the abandonment of social services, among others – that all spell out President Aquino's incapability to govern. The vice chairperson of People Surge also slammed the President for belittling the immediate demands of the petitioners from Eastern Visayas, and for flippantly suggesting to those criticizing government's inaction that they can find a livelihood if they have time to protest. MANILA, Philippines – Aconex, provider of the world's most widely used construction project management software, has serviced the Zuellig Building project in Manila's Makati City financial center. Developed, owned and operated by Bridgebury Realty Corporation, an affiliate of the Zuellig Group, the 155-meter office building is the first structure in the Philippines to be pre-certified under the Gold Level LEED-CS (Leadership in Energy and Environmental Design - Core and Shell) program of the U.S. Green Building Council. The project team for the Zuellig Building numbered more than 180 members from 20 different organizations. All used the Aconex platform to access distribute, track, and archive project information, processing up to 2,000 documents and 10,000 items of correspondence per month through the secure, centralized system. Since many team members were frequently on the go, they used Aconex Mobile for information access and communications from mobile devices -- anywhere, any time. "Our engineers roamed around the project, and rather than waiting until they were back at their desks, they could send people a photo to instantly access and action," said the executive director of Bridgebury Realty. "We didn't have to worry about file sizes for weekly status reports and everyday communications because the system could transmit huge files. Also, having Aconex in place meant that, if anything didn't go well, we were covered -- you can't delete anything. Our philosophy is to be very transparent, and the degree of risk management was very comforting." The executive director cited the multiparty neutrality of the Aconex platform -- where all correspondence is visible to all authorized parties -- and the complete audit trail of project information as capabilities that were especially important in mitigating risk for the Zuellig Building development. He added, "I can only imagine how difficult this project would have been using hard copies and email. With Aconex, any information related to the project was literally at our fingertips." "The Zuellig Building is part of the next generation of office towers in metropolitan Manila, built to the highest standard of environmental sustainability," said Andy Lake, general manager of Asia at Aconex. "Bridgebury's project team consisted of tier-one design, engineering and construction firms, and we're pleased to have helped them implement collaborative processes and information management in line with industry best practices. We look forward to servicing additional projects like this one throughout Asia." PASAY CITY – Senate Majority Leader Alan Peter “Companero” S. Cayetano on Monday questioned why Sen. Juan Ponce Enrile has yet to file charges against his former Chief-of-Staff Jessica Lucila “Gigi” Reyes and another staff, one Jose Evangelista after they were implicated by whistleblowers and state witnesses in the P10-billion pork barrel scam. Cayetano said that if Enrile is denying any participation in the alleged abuse and misuse of his Priority Development Assistance Fund (PDAF), then the natural course of action to pursue is to file charges against his staff implicated in the controversy. “Bakit hindi pa kinakasuhan ni Sen. Enrile ‘yung mga empleyado niya? If I found out na may kalokohan sa opisina ko, I have two choices lang: I fire them and file a case or i-coddle ko sila at itago,” he said. Cayetano disclosed that there are documents to show that Sen. Enrile authorized Gigi Reyes and Evangelista, listed as a deputy chief-of-staff, to sign his PDAF papers on his behalf. The two were implicated by Ruby Tuason during the last hearing of the Blue Ribbon panel on the pork barrel scam. The said documents were allegedly signed by Enrile and addressed to the Commission on Audit. They authorize Reyes and Evangelista to sign pertinent documents to ensure proper implementation of livelihood projects funded allegedly by Enrile’s PDAF. Cayetano said he came out with the documents amid discussions on the failure of Ruby Tuason to directly link Enrile to the pork barrel scam. “I brought this out to prove na hindi naman palaging kailangan testimony [to link anyone to the controversy],” he said. The Senate leader also chided Enrile’s statement that the minority leader will be facing the allegations of his participation in the pork barrel scam once they are filed in court. “But remember, he’s a public servant. He owes it to the public, all of us owe it to the public to explain. Can you imagine what will happen if sa korte lang magpaliwanag lahat ng public officials, ayaw nilang magpaliwanag sa media and then ma-acquit ka dun and then ang tingin sa iyo ng tao ay guilty ka,” Cayetano said. QUEZON CITY – “An apologist of human rights violators has no place in the Martial Law victims’ claims board,” said SELDA chairperson Marie Hilao-Enriquez in protest of the appointment of retired PNP Gen. Lina Castillo-Sarmiento as head of the Human Rights Victims Claims Board. The Human Rights Victims Recognition and Reparation Act of 2013 or RA 10368 states that members of the claims board 1) must be of known probity, competence and integrity; 2) must have a deep and thorough understanding and knowledge of human rights and involvement in efforts against human rights violations committed during the regime of former President Ferdinand E. Marcos; 3) must have a clear and adequate understanding and commitment to human rights protection, promotion and advocacy. SELDA formed the People’s Claims Board that will act both as a watchdog and a monitoring body of Aquino’s HRVCB. The priority of the People's Claims Board is to ensure that real and legitimate martial law victims will not be marginalized. Members of the People’s Claims Board are former Bayan Muna Rep. Satur Ocampo, SELDA chairperson Marie Hilao-Enriquez, SELDA vice-chairperson Bonifacio Ilagan, former Gabriela Women’s Party Rep. Liza Maza, UP Prof. Judy Taguiwalo, Dr. Edelina dela Paz, Atty. Kit Enriquez and Atty. Dominador Lagare, Sr.
QUEZON CITY – Women rights group Tanggol Bayi criticized the recent appointment of Gen. Lina Sarmiento of the Philippine National Police as chair of the Human Rights Victims Claims Board that shall process the recognition and reparation of Martial Law victims. "The appointment of a police general, one from an institution which has systematically spawned rights violations including numerous sexual forms of violence against women since the Martial Law period, is an affront to Filipinos and all victims of human rights abuses," said Kiri Dalena, Tanggol Bayi convenor. "These human rights violations are continued by the Armed Forces of the Philippines and the Philippine National Police. During the Arroyo administration, when Sarmiento was part of the PNP Human Rights Office, 152 women were women victims of extrajudicial killing, 31 women were disappeared, while 290 women were illegally arrested and detained," said Cristina Palabay, Tanggol Bayi co-convenor. "We decry Aquino's use of the gender card to justify the appointment of a police general to a body that is supposed to deliver justice to women victims of Martial Law. While it is important to promote the substantive and democratic participation of women in all political processes, the appointment of Sarmiento does not, at all accounts, indicate that the poor, marginalized and disadvantaged Filipino women who suffered and struggled during the Martial Law period will attain justice, with a representative of their oppressors at the helm of the claims body," Palabay said. Tanggol Bayi likewise scored Malacanang's disregard for its women nominees to the claims board, who are publicly known for their "deep and thorough understanding and knowledge of human rights and involvement in efforts against human rights violations" and "clear and adequate understanding and commitment to human rights protection, promotion and advocacy." These are minimum qualifications needed for claims board members under the Human Rights Victims Reparation and Recognition Act of 2013. The women's group nominated former Rep. Liza Maza, one of the primary authors of the said law and a known women's rights activist, and Prof. Judy Taguiwalo, who is a Martial Law victim and a women's rights advocate. They also supported the nomination of Marie Hilao Enriquez, a veteran human rights activist and daughter of one of the named plaintiffs in the Hawaii class suit against the Marcoses. MANILA – A storytelling activity was held this morning by rights group Hustisya for the children survivors of typhoon Yolanda (Haiyan) on the 100th day since it struck Eastern Visayas and other parts of the Visayas. The event, titled “Susmatanon: Mga Kwento ni Lolo Edong,” featured stories of a fellow Waray, political prisoner Eduardo “Edong” Sarmiento. “Susmatanon” is a Waray term for “kwentong bayan” (folklore). It will also be the title of the book when published. It consists of six children’s stories of Sarmiento, which presents social issues of justice and peace written in the simplest manner. 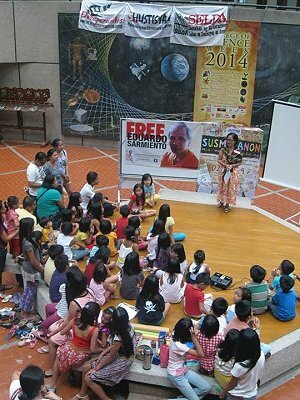 Held at the UP College of Science Library, “Susmatanon” brought together not only children victims of typhoon Yolanda but also children of victims of human rights violations. “We deemed it very significant that we hold this activity on the 100th day since typhoon Yolanda struck. We are one with the people of Samar and Leyte and other parts of the Visayas in their call for justice. Thousands of people are denied of the much needed help and rehabilitation. It has made their sufferings worse, and we should all demand accountability and justice from the Aquino government,” said Ma. Cristina Guevarra, Hustisya secretary general. Sarmiento, whom the organizers fondly introduced to the children as Lolo Edong, has been longing to share his unpublished book of children’s stories to his fellow Waraynons, but cannot personally do so because of his unjust imprisonment. Sarmiento was fully denied of due process when he was sentenced to 40 years imprisonment by Judge Myra Bayot Quiambao of the Muntinlupa Regional Trial Court (RTC) Branch 203 on 11 December 2013 for the trumped up criminal charge of illegal possession of explosives. He further sent his messages of hope to the children: “Makikisuyo ako na maipaabot sa mga bata ang aking mainit na pagbati. Pakisabi sa kanila na huwag mawawalan ng pag-asa dahil may liwanag sa dilim at may bahaghari pagkatapos ng bagyo.” (May I ask for a favor to extend my warmest greetings to the children. Please tell them not to lose hope for there is light after the dark and there is a rainbow after the storm). Storytellers of the activity are 2010 Ms. Universe fourth runner up Venus Raj, stand-up comedian Karen Dematera, and children’s storytellers JK Anicoche and Amihan Ruiz. “The children and Lolo Edong both suffer from injustice. Let this activity served as a channel for relaying the message that we should all work together for the attainment of justice. We should not let those people in power further torment the tormented. We call on our fellow Filipinos to work together to deter human rights abuses by helping those incarcerated hold their persecutors accountable. We call to free Lolo Edong! We call for justice for the people of Samar and Leyte and the rest of the Filipino people who suffer injustice,” Guevarra ended. TACLOBAN CITY – The Aquino government is facing the mounting anger of the people in Eastern Visayas over its failure to lift them from their misery, said People Surge, an alliance of survivors of Typhoon Yolanda (Haiyan). 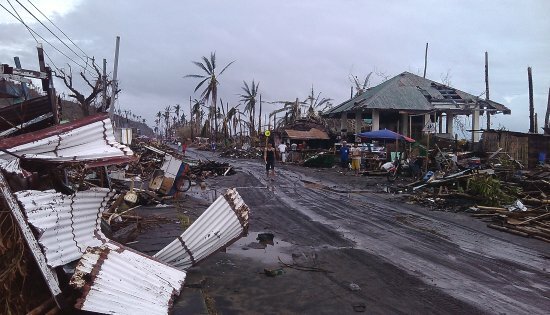 A hundred days after the storm hit, many victims are still struggling to survive under harsh conditions. Sr. Eslopor explained that the most glaring fact about the post-Yolanda reconstruction program is that the people are not at the center of the program. “There is no still no clear plan for recovery and reconstruction, which is estimated to cost P360.9 billion pesos, according to the blueprint Recovery Assistance for Yolanda by the National Economic and Development Authority. Is it because such a huge amount of money is stirring a frenzy of horse-trading between the government and the big foreign and local businesses it seeks to partner with? The design is geared towards public-private partnerships, meaning the reconstruction will be dictated by the private sector." Based on a study conducted by the People Surge, more than 2 million farmers and fisher folks in Eastern Visayas alone were affected. Its own estimate is that the total damage to agriculture would reach up to P64 billion. This includes coconut production losses valued at P41.958 billion, P6.428 billion damage to the fishing industry, P5.695 billion damage to banana plantations, P3.462 B damage to palay (unhusked rice), and P6.5 billion damages to livestock and root crops, abaca, corn and vegetables. Eighty percent of the population in the Eastern Visayas region rely on agriculture yet this will receive the lowest budgetary priority under the government’s reconstruction framework. Sr. Eslopor said the government's failure to heed the people's plight led to the founding of People Surge last January 24-25 in Tacloban City, in the biggest mass demonstration in Eastern Visayas in recent years. Some 13,000 protesters from all over the region marched along downtown Tacloban demanding government action on the victim’s demands. This includes a demand for P40,000 financial assistance for families affected by the storm. Protests are scheduled in different parts of the region on the issues raised by People Surge. The group plans to submit to Malacanang tomorrow the signatures of a petition it drafted demanding financial assistance and a stop to the “no-build-zone” policy affecting many coastal communities.